Purpose: To identify problems in the Corinthian church, to offer solutions, and to teach the believers how to live for Christ in a corrupt society. Setting: Corinth was a mayor cosmopolitan city, a seaport and major trade center- the most important city in Achaia. It was also filled with idolatry and immorality. The church was largely made up of Gentiles. Paul had established this church on his second missionary journey. Key verse: "I appeal to you, dear brothers and sisters, by the authority of our Lord Jesus Christ, to live in harmony with each other. Let there be no division in the church. Rather, be of one mind, united in thought and purpose" (1:10). Special features: This is a strong, straight-forward letter. Division in the church (1–4). 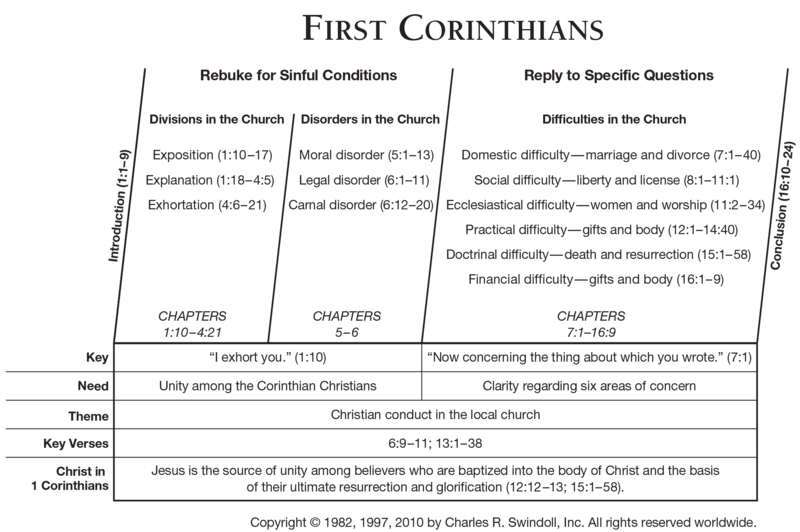 Misunderstanding of spiritual (charismatic) gifts (12–14). Richards, L., & Richards, L. O. (1987). The teacher's commentary. Includes index. (839). Wheaton, Ill.: Victor Books. Reject pagan approaches, seeking to understand God’s patterns of thought. Regard human leaders as servants; reserve glory for God. Deal firmly with sin in the family. Act to resolve disputes equitably. Love and truth are both required for resolution. Being “right” does not remove love’s obligation to build up our brothers. Possession of certain gifts is not evidence of spiritual achievement. Love is the key indicator of spiritual maturity. As a body, family members are interdependent; each gift is important, and each person’s ministry is needed. Because women are affirmed as equally valued persons in the body of Christ, no woman needs to deny her womanhood. Richards, L., & Richards, L. O. (1987). The teacher's commentary. Includes index. (873). Wheaton, Ill.: Victor Books. New Geneva study Bible. 1997, c1995 (electronic ed.) (1 Co 12.1). Nashville: Thomas Nelson. Brings union and relaionship with Christ. Brings communion and fellowship with Christ. Introduces us into the body of Christ. Is never commanded of us. Is commanded as a repeated action. A positional state brought about by God at salvation. An experiential state brought about by our submission and obedience to God’s will. All Christians have had this experience. All Christians should have this experience, but some do not. New Geneva study Bible. 1997, c1995 (electronic ed.) (1 Co 12.9). Nashville: Thomas Nelson. Love is one of the dynamic terms Paul uses to speak of the holy life enabled by the fullness of the Holy spirit. It encompasses motive and deed. Love is characteristic of the mature believer. New Geneva study Bible. 1997, c1995 (electronic ed.) (1 Co 12.30). Nashville: Thomas Nelson. 1. A Great Hoax (the resurrection is false). 2. Mythology (the resurrection is fiction). Jesus did not actually die. Jesus’ spirit returned but not his body. The resurrection is only a myth or story with a teaching point. A real Jesus is probable, but not really necessary. The body was stolen by (1) the Jews (2) the Romans, (3) the disciples (Matt. 28:11–15), or (4) Joseph of Arimathea (John 19:38ff.). The disciples went to the wrong tomb, found it empty, and erroneously concluded that Jesus had risen. The disciples fabricated the resurrection story for profit. The disciples mistook for Jesus someone who looked like him. Jesus was raised from the dead, historically and bodily, by the supernatural power of God (1 Cor. 15:3ff.). New Geneva study Bible. 1997, c1995 (electronic ed.) (1 Co 15.8). Nashville: Thomas Nelson. The church at time, must exercise discipline toward members who have sinned. But church discipline must be handled carefully, straightforwardly, and lovingly. Public sin and/or those done flagrantly and arrogantly 2. If he/she does not listen, go with one or two witnesses. 1. Remove the one in error from the fellowship (1 Corinthians 5:2-13). 2. The church gives united disapproval, but forgiveness and comfort are in order if he/she chooses to repent (2 Corinthians 2:5-8). 3. Do not associate with the disobedient person; and if you must, speak to him/her as one who needs a warnings (2 Thessalonians 3:14, 15). 4. After two warnings, reject the person from the fellowship (Titus 3:10). Worship is first and foremost an encounter with the living and holy God. God is our friend, but he is also our sovereign Lord. To approach him frivolously shows a lack of respect and sincerity. When you come to God in worship, do you approach him casually, or do you come as though you were an invited guest before a king? Worship is only as real as the involvement of those participating. "The LORD gave these instructions to Moses on Mount Sinai when he commanded the Israelites to present their offerings to the LORD in the wilderness of Sinai" (Leviticus 7:38). All the rituals in Leviticus were meant to teach the people valuable lessons. But over time, the people became indifferent. When your church appears to be conducting dry, meaningless rituals, try rediscovering the meaning and purpose behind them. Your worship will be revitalized. The LORD said to Moses, 'Give these instructions to the people of Israel: The offerings you present as special gifts are a pleasing aroma to me; they are my food. See to it that they are brought at the appointed times and offered according to my instructions" (Numbers 28:1-2). Following these rituals took time, and this gave the people the opportunity to prepare their hearts for worship. Unless your heart is ready, worship is meaningless. God is delighted when you are prepared to come before him in a spirit of thankfulness. "Sing praises to God, our strength. Sing to the God of Jacob. Sing! Beat the tambourine. Play the sweet lyre and the harp. Blow the ram's horn at new moon, and again at full moon to call a festival!" (Psalm 81:1-3). Israel's holidays reminded the nation of God's great miracles. Remember the spiritual origin of the holidays you celebrate, and use them as opportunities to worship God for his goodness to you, your family, and your nation. Worship and music go hand in hand. "David and the army commanders then appointed men from the families of Asaph, Heman, and Jeduthun to proclaim God's messages to the accompaniment of lyres, harps and cymbals" (1 Chronicles 25:1). David instituted music for the temple worship services. Worship should involve the whole person, and music helps lift a person's thoughts and emotions to God. Through music you can celebrate God's greatness. Worship is bringing the best believers have to Christ. "They entered the house and saw the child with his mother, Mary, and they bowed down and worshiped him. Then they opened their treasure chests and gave him gifts of gold, frankincense, and myrrh" (Matthew 2:11). The wise men brought gifts and worshiped Jesus for who he was. This is the essence of true worship—honoring Christ for who he is and being willing to give to him what is valuable to you. Worship God because he is worthy of the best you have to give. Genuine worship results in sub-mission and obedience to Jesus. Jesus is more than just a great leader. He is the Son of God. When you understand this profound truth, the only adequate response is worship. When you have a correct understanding of Christ, you will obey him. Everything done in corporate worship must be beneficial to the worshipers. "Since you are so eager to have the special abilities the Spirit gives, seek those that will strengthen the whole church" (1 Corinthians 14:12). This principle touches every aspect of worship. Those contributing to a worship service must speak useful words or participate in a way that will strengthen the faith of other believers. In worship, everything Must be done In harmony and with order. "Be sure that everything is done properly and in order" (1 Corinthians 14:40). Even when the gifts of the Holy Spirit are being exercised, there is no excuse for disorder. When there is chaos, the church is not allowing God to work among believers as he would like. Make sure that what you bring to worship is appropriate, but also make sure that you participate. Without Paul’s presence, the Corinthians church had fallen into divisiveness and disorder. This resulted in many problems. which Paul addressed squarely. We must be concerned for unity and order in our local churches, but we should not mistake inactivity for order and cordiality for unity. We, too, must squarely address problems in our churches. The Corinthians had sent Paul a list of questions, and he answered them in a way mean to correct abuses in the church and to show how important it is that they live believe. Paul gives us a Christian approach to problem solving. He analyzed the problem thoroughly to uncover the underlying issue and then highlighted the biblical values that should guide our actions.